As the title says, these are a NEW pair of earrings, that i made today. Here is a bracelet I have made for my friend Sonny's Tenth Birthday. He plays the drums and has even played live on stage with the Edgar Broughton Band!! 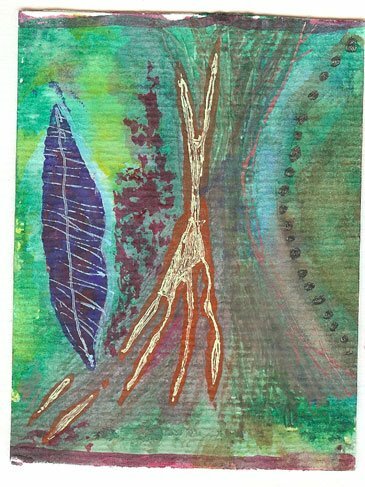 A change from jewellery - extracts from Toby's sketch book, and little painting, 'The insanity of trees' in watercolour, gel pens and pencils. 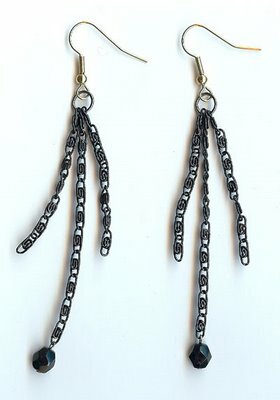 A more quirky design of Toby's to show you, handmade polymer clay beads with safety pins which rotate around the bracelet giving movement to the piece. 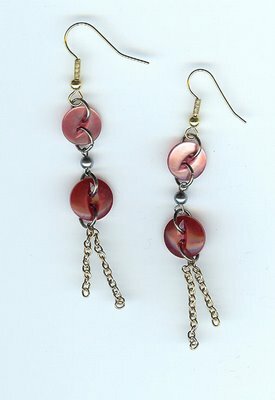 I have just made this pair of earings for my friend Sarah. They are called "Gothic Gold". 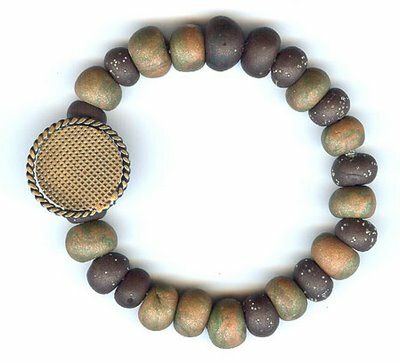 The vintage button bracelet seemed to be popular, so, here are 2 more from the range. As with the brown one before, these are flexible, floppy bracelets. 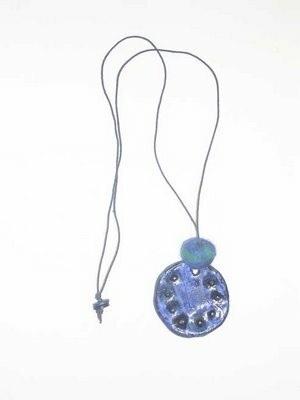 All the buttons are vintage and they swivel round between the handmade polymer clay beads. One is in whites and greys, golds and silver, the other is like midnight, with dark blues, blacks, and hints of silver and gold. There are many uses for buttons, not just jewellery, here is another of Toby's creations, but done in photoshop this time using Gretel's ex-buttons! I woke up this morning to find that i had recieved 2 cheques in the post. One was from mum's friend Angie who bought two orange bracelets, the other from Gretel who also bought a bracelet and she enclosed the top set of three buttons in this photo as a present for me; which complement the lower set of buttons which i already had. Thanks Gretel. Toby. Our deadline is looming, we have to have all our jewellery made for the shop by the end of this month. Toby has been working SO hard, he has made a beautiful range mixing sterling silver with our most precious treasures. We will take photographs of it all to put on our "Attrills" blog soon. We have also been making jewellery with hemp, buttons, and felt but have so much left to do that we wont be posting here for a while, need to get our heads down and work!!! 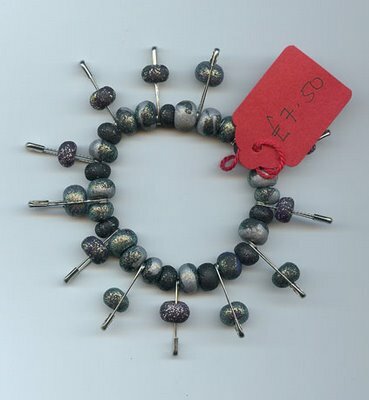 We found a knitting shop in Hebden Bridge that sells old buttons individually for around £1.50 each, we have been searching the net and ordering from ebay, and this coming week we will be going on a treasure hunt around antique fairs and flea markets to find more. Regarding presentation, we have found white boxes in various sizes for the Attrills range. Laurence, the other Attrill ! (my husband and Toby's father) has printed little sticky labels for us and also put together a most complicated label that I designed which is in 4 layers, of acetate, paper and card all fixed together with an eyelet. He came home from work one evening this week and we presented him with 80 x 4 layers, to cut up and put together by hand, which he did, finally eating his evening meal at 11.30pm, thanks Laurence! 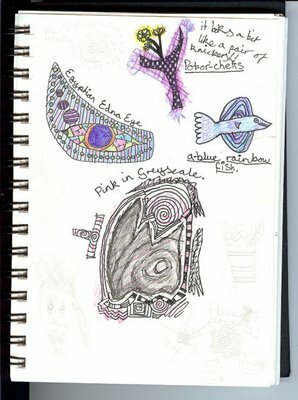 I have also been sorting out the website with my friend Yvonne. Toby and I have told her how we want it to look, design, layout, colours, images etc and she is building it, she has been very patient with our, especially my, fussyness! it is almost finished now and should be ready in about a week, will keep you posted. The buttons that my dad won on eBay have finally arrived. They're vintage glass ones so they will be going onto some more exclusive silver jewellery. I have been busy making this for the 'Attrills' range, which will be available from september. I have been thinking about swapping or buying buttons etc with you all, and wanted to say that we are using them for jewellery to sell, so please charge a realistic price or swap for equivalent value. I would hate to think that in the future we were selling a necklace with one of your beads for a hundred pounds or somthing and you had given the item for free. Penny. We received a wonderful package in the post yesterday, Toby and I were fighting to open it! Dons, http://craftyoldthing.blogspot.com/ ( thanks Dons!) 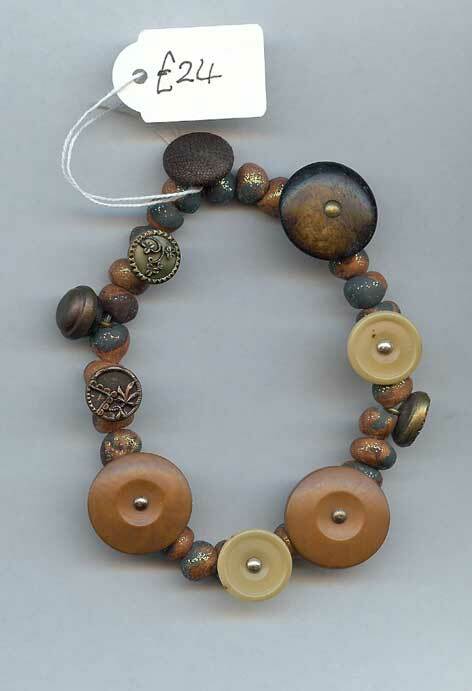 swapped some of her buttons for Toby's Autumn Spiral bracelet. Here just a few from our swap. The tiny blue glass button is one of our favourites, I think it would be lovely for the jewellery, but Toby has decided to start a "personal collection" to keep for himself, so that will be home for the little blue button now. Swaps! - we are on the look out for vintage glass beads, interesting looking buttons, old chains (even broken ones), anything small, old, or unusual that we can use in our creations. Does anyone else have anything that they would like to swap or sell? If you do, contact me privately to exchange addresses pennyjohnson@omniadesigns.com We are looking forward to lots of emails now!!!! Hi its Toby here I've just come back from camp so sorry I haven't posted for ages. I've been down to the flea market today and bought some lovely glass buttons. Any ideas on how old they might be? 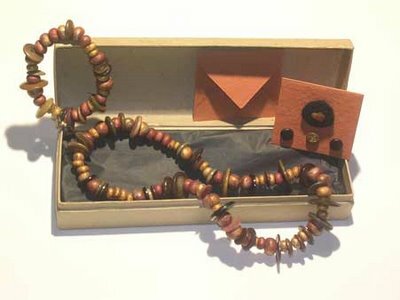 "Autumn Conkers" is a necklace and bracelet set, handmade polymer clay beads and buttons, in a box with a handmade card and envelope to match, £35. 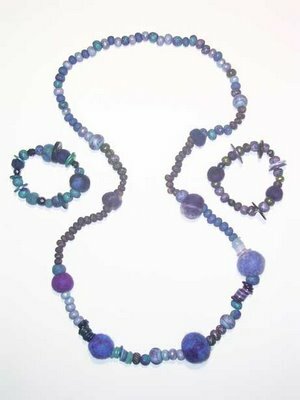 "Hyacinth" is also a set, a long necklace and 2 bracelets, handmade clay beads, buttons and hand rolled felt beads, £55. 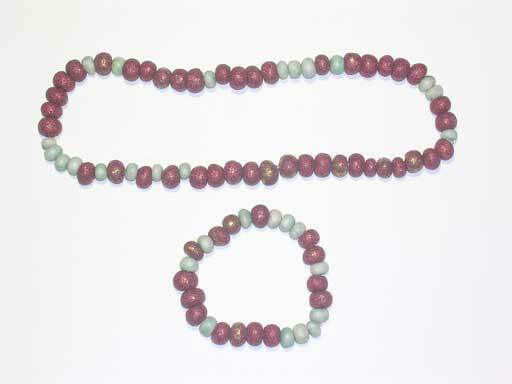 "Cherry Blossom" is a matching necklace and bracelet, handmade polymer clay, £15 the set. "Colbalt" is a handmade ceramic pendant, kiln fired and glazed, strung with a hand rolled felt bead, and finished off with 2 little buttons at the back, £15. They also took a range of our bracelets. Here are some more bracelets we have made up, these are a little more expensive, £6.50, this is because of the buttons, vintage beads and style of polymer clay.